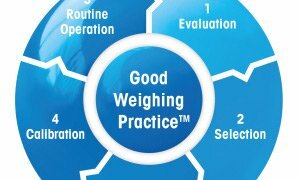 ISO 9001 – What's the impact on weighing and calibration? You are here:Home Knowledge and Expertise Resources ISO 9001:2015 – What Do the Changes mean for Weighing? Explain the changes in the revised standard of ISO 9001:2015. 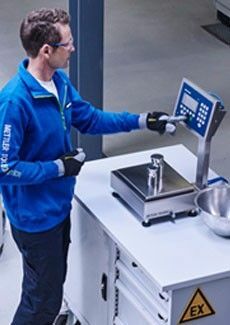 Look at the effect of these changes on weighing devices and weighing processes. to a Quality Management System. 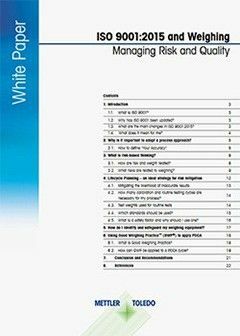 Download the White Paper "ISO 9001 and Weighing"
ISO 9001 is a standard that sets out the requirements for a quality management system. It helps businesses and organizations be more efficient and improve customer satisfaction. When was the new version published? ISO-9001 was first published in 1987 and is regularly updated to ensure that it remains relevant to today’s business environment. A new version of the standard ─ ISO 9001:2015 ─ was published in September 2015, replacing the previous version (ISO-9001:2008). Organizations have a three year transition period – until September 2018 – to adopt the changes. ISO 9001:2015 focuses on ensuring customer satisfaction - whether consumer, end-user, or regulatory body - and recognises the way globalization is changing modern business. 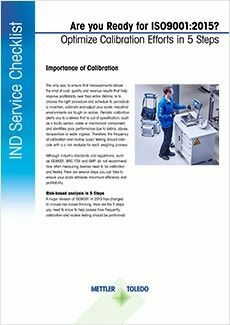 As ISO-9001 is designed to be flexible for use by different types of organizations, it deliberately does not specify what the objectives relating to “quality” or “meeting customer needs” should be. Instead, it requires organizations to define these objectives themselves and continually improve their processes in order to reach them. ISO-9001 has a new structure and now follows the same overall High-Level-Structure (HLS), developed within the ISO community, as other ISO management system standards. This provides consistency and makes it easier for anyone using multiple management systems (e.g. environmental management, quality management). The ISO-9001:2015 revision requires top management to demonstrate leadership and commitment to the Quality Management System (QMS). It makes management accountable for the effectiveness of the QMS, ensuring resources are available, and promoting continuous improvement. However, the use of the process approach and risk-based thinking is not just the responsibility of management. It should be everyone's business, and should become an integral part of the organizational culture. In other words, quality becomes a company-wide practice and not solely the specific responsibility of the quality manager, or the quality department. A process approach has been an important part of ISO 9001 since 2000 and continues to be in the 2015 version. The revision has a focus on improved process performance by adopting a Plan-Do-Check-Act (PDCA) cycle to manage processes, and the interaction of those processes as a system, with an overall background of risk-based thinking. It is important to recognize that not all processes have the same impact on an organization's ability to deliver conforming products and services. Moreover, the new changes are not prescribed, but are left to the manufacturer to evaluate based on their processes, associated risks and their customer's expectations for high quality.